Reflect on your personal values and create a vision for yourself that will spark future action. Develop a basic understanding of Peter Senge’s Five Disciplines: Personal Mastery, Shared Vision, Mental Models, Team Learning and Systems Thinking. Learn about what makes a leader. 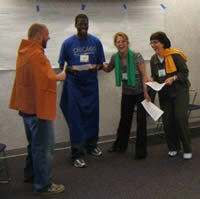 Become bonded into a learning community reflective of trust and openness. This Personal Mastery session is conducted by Pat Everett, consultant with Insight, Inc. During this session you will learn about yourself and others through the Insight Personality Instrument. This will give you a new perspective on how to appreciate and capitalize on your own and others’ strengths and differences. “This is a whole new way of understanding people. 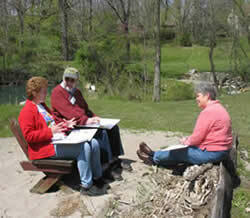 This class is facilitated at The Howell Nature Center in Howell, MI. Here SLI participants will use adventure-filled activities to solve problems, make decisions, offer encouragement and work as a team. Our Systems Thinking session is taught by Eric Budd, Improvement Coordinator at Peaker Services, Inc. Eric has over 25 years experience in key business process improvement where he has worked closely with leaders and their organizations to integrate a culture of quality and improvement into their everyday operations. This interactive session will enhance your knowledge about these valuable concepts and how to apply them to better understand your organization and community, how they work and what it takes to improve them. During this learning session Diand Biondi Mukkala explores the role of individuals in building communities and addressing community needs. You will gain knowledge about issues facing communities, how to address problems and use your talents to advance and sustain your community. Our Mental Models session is taught by Betsy Hemming, Participants explore the different ways people think about the world and draw conclusions. This learning discipline helps you better understand and recognize your internal “picture” of the world and how it shapes your actions and decisions.